Note: Besides using the precompiled version a open source system offers the possibility to optimize the system for own purposes. Here You will find a description of the necessary tools. Collect Informations about the AVR Microcontroller range of devices. See the Atmel AVR site and also the AVRFreaks web site or Mikrocontroller.net is another good place to start. On these sites you will find good application notes, sample code, data sheets, information about software, hardware and development system tools etc. They have a specific GCC page that has several tutorials and other useful information. Besides there is a lot of open source in the web, e.g. a USB end point, Open Source RTOS or a Webring. A good simulation environment ist AVR Studio from Atmel. WinAVR can be integrated in AVR Studio, thus resulting in a complete IDE. install Microsoft Windows Installer 3.1.4000.2435 Redistributable. Besides the target hardware (I use OpenDCC, of course) You will need a flash programmer for the first programming. 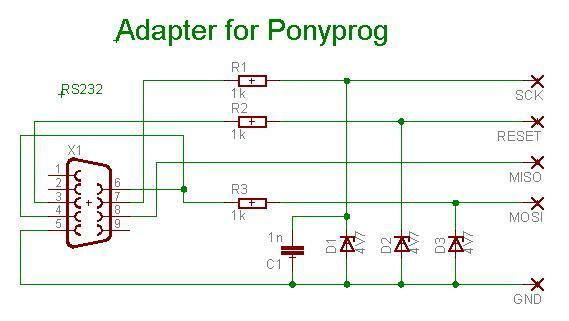 I'm using ponyprog, the needed connectors are on the PCB, but I recommend the use of an externalAdapter; Or you can buy a Atmel AVRISP programmer. Set the optimize level to -Os, the speed of the cpu according to the project: for OpenDCC 16MHz, for decoders 8 or 10MHz. Thus additional memory areas for eeprom are defined to bind EEPROM Variablen to fixed an predefined addresses. Currently these settings are not forwarded correctly to WinAVR, therefore the content of eeproms is defined in one structure - esp. for decoders. 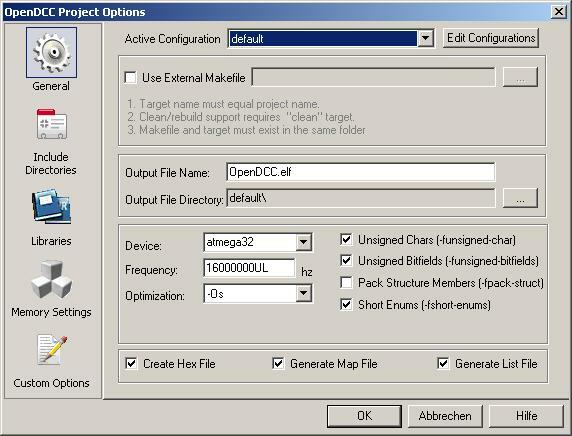 OpenDCC_XP uses an external Makefile 'Makefile_EECV' to control the allocation in EEPROM. Now unzip the software files to the working directory and use "add existing source files" to add all header and c files. Now the system should compile with BUILD (=Taste F7). A easier way: just open the contained OpenDCC.APS with 'Project - Open', all setups will be loaded correctly. The file dccout_without_feedback.c is only a backup of dccout.c and should not be included. http://palmavr.sourceforge.net or http://www.engbedded.com/ is an excellent tool to calculate the fuses.